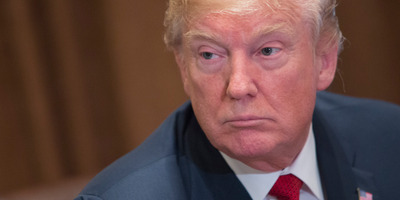 President Donald Trump tweeted about reports that a Russian with ties to the Kremlin sold purported dirt on Trump to US officials seeking to recover stolen cyberweapons. He also alluded to the abrupt exits of two former White House aides following reports detailing domestic abuse allegations against them. “I hope people are now seeing & understanding what is going on,” he tweeted in response to the reports of US officials paying the Russian to recover hacking tools. President Donald Trump went off on Saturday about recent developments that have shaken the White House and the US national security apparatus. First, he tweeted about a New York Times report which found that a Russian with questionable ties to Russian intelligence attempted to sell unverified “kompromat” on Trump to American spies last year. The Russian got in touch with US intelligence officials in early 2017, after they offered to pay for top-secret cyberweapons that the Shadow Brokers, a hacking group said to be aligned with the Russian government, stole from the National Security Agency in the summer of 2016, the Times reported. According to the report, the Russian initially demanded a $US10 million payment in exchange for the cyberweapons in addition to kompromat on Trump. The price was later whittled down to $US1 million, to be paid in separate installments. US officials made it clear they were only interested in the hacking tools, and that they did not want the purported dirt on Trump. They suspected that the offer of kompromat was part of a disinformation campaign to sow political discord within the US – a tactic the Kremlin had already employed when it interfered in the 2016 presidential race. Officials also suspected that the deal was an attempt to pit the US intelligence community against the president. After several meetings towards the end of 2017 during which the Russian repeatedly showed up with the purported dirt but without the stolen cyberweapons, American officials cut off the deal and warned the man to go back to Russia and stay there, the report said. Trump has often accused senior officials at the FBI, the Department of Justice, and the intelligence community of working to undermine his presidency. Most recently, the president latched onto a memo released by the House Intelligence Committee last week – which purports to show surveillance abuses by the FBI and DOJ – as evidence of that theory. Trump also appeared to allude to recent shakeups within the West Wing after two key staffers were forced out amid allegations of domestic abuse. Rob Porter, the former staff secretary, and David Sorensen, the former speechwriter, both left the White House this week after their ex-wives accused them of physical and verbal abuse while they were married. Colbie Holderness, who was married to Porter from 2003 to 2008, has provided photos to the FBI and news outlets of a black eye she says he gave her. Jennifer Willoughby, Porter’s wife from 2009 to 2013, provided a copy of a 2010 protective order she filed against him. Sorensen’s ex-wife, Jessica Corbett, accused him of running a car over her foot, putting out a cigarette on her hand, throwing her into a wall, and grabbing her by her hair when they were alone on their boat, according to the Washington Post. White House spokesman Raj Shah said the administration “confronted” Sorensen on the matter, after which he resigned. Both men have consistently denied the allegations against them. The White House was roped into the controversy after reports surfaced this week that White House counsel Don McGahn and Chief of Staff John Kelly knew about the allegations against Porter since last year and did not investigate them. Shah said earlier this week that administration officials “could have done better” in dealing with the allegations.